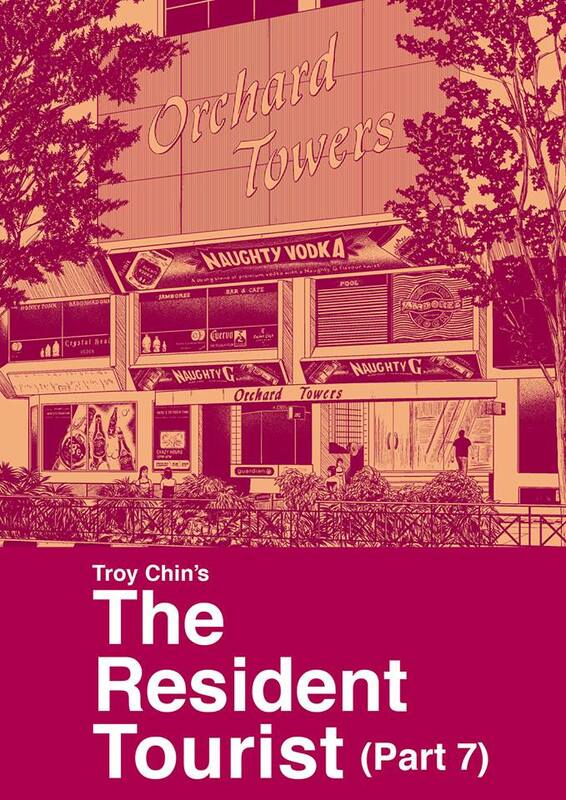 At the launch of the seventh edition of Troy Chin’s The Resident Tourist held at Books Kinokuniya, the author himself mentioned to me that my reviews of his books are ‘biased’. Meaning that my glowing assessments of his work are somehow less than objective due to the fact that I appreciated their intrinsic value as art. That in a nutshell sums up Troy Chin and his self-deprecating manner. However, this attitude belies the importance and significance of Troy’s work as Troy’s own character traits demands an unwavering commitment to honesty but at the same time recognises the human frailties in achieving such high standards. This dichotomy and tension is what ultimately makes The Resident Tourist series as engaging as it is. Is there any other Singapore work that so bravely (and uncompromisingly) attempts to define the Singaporean experience as The Resident Tourist? After Part 6’s rather cold and hard (and yes, hilarious) look at Singapore politics (such as it is), Part 7 chronicles Troy’s existential dilemma at being unable to accept a measure of success when it comes his way. True to his nature, he is unable to believe that he has arrived just because he has won an arts award & is being embraced by the authorities themselves. Instead of expanding his horizons, he turns inwards and begins a process of harsh self-analysis (that involves examining his National Service past) that by the end of the book, confirms the direction of life he wants to follow. One theme that resonated with me throughout the book was the presence of the wild monkeys littered at appropriate spots in the story. Quite like the wild boar, the wild monkeys to me represented a freedom to do what came naturally – to give in to instincts – which is what our Resident Tourist does at the end of the story. This comments directly on the social pressure in Singapore to ‘do the right thing’ – when in fact, the reality is quite the opposite. The facade of community is laid bare in our main character’s harsh life lessons and the dishonesty of the clean, self-righteous Singapore delusion revealed. As I often state, yes I am biased… about excellent work. And Resident Tourist (Part 7) is indeed excellent.